Good morning to you all! Thanks for sticking by me during my sick day yesterday. I still feel a little blah, but at least it's minus the pounding migraine. Today, I have for you the last set of The New Black for the week. It's more of a nail art set, unlike anything else I have tested out this week, and is called the Times Late Edition set. 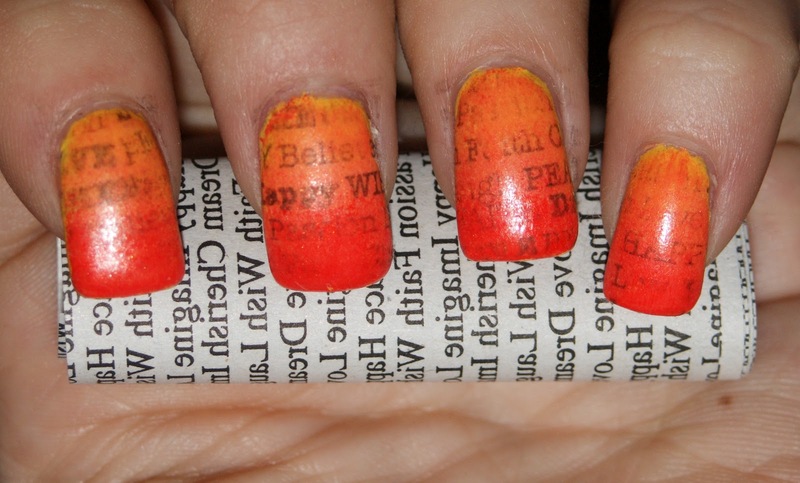 Newspaper manicures have become all the rage in the world of nail polish. It's pretty easy and relatively anyone can do it. Unfortunately, there are a few problems. 1) You need to use nail polish remover to do it, leaving an unpleasant smell on your hands or drying out cuticles. 2) The newsprint is from an article of your choosing, but there are bound to be words and phrases you don't want on your nails. 3) Most importantly, THE PRINT IS BACKWARDS! The only way to read your nails is with a mirror! The typography set, which includes a transfer solution and topcoat, solves this. It includes custom sheets of newsprint with phrases like faith, peace, and believe, printed mirror image style so it comes out readable on your nails. And trust me, if you mess up a few times like I did, it's okay. There are enough sheets in there for at least 40 manicures. I swear. 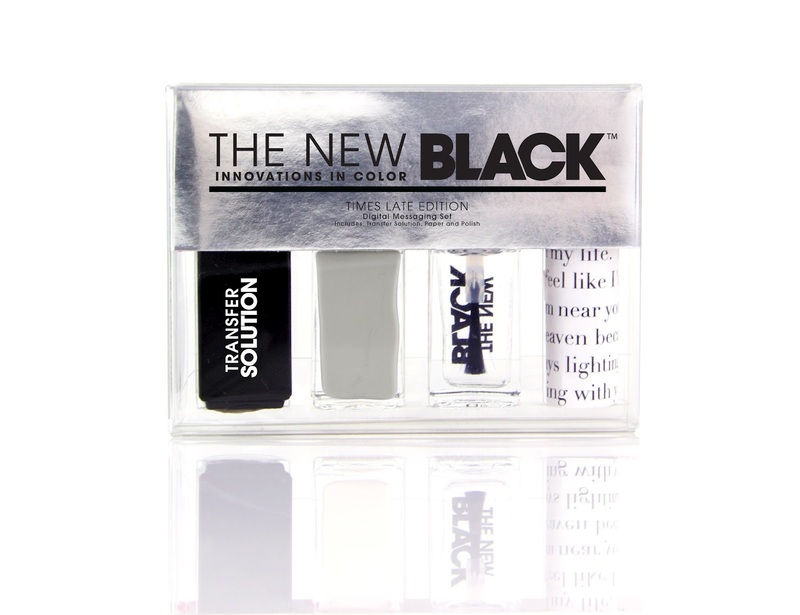 It also comes with a putty-colored gray that makes your nails look just like a newspaper. I wanted to keep the AWESOME fire gradient from the Runway collection and figured this would be a good opportunity to test out the set on other shades. It's very simple to do. You cut the print the size of your nail, apply transfer solution all over the nail (don't be stingy with it), place the print on the nail, and apply pressure with a cotton ball so that the print saturates. Thirty seconds later, you're done! As you can see, the end result was decent. I think with a few more manicures of practice, I could get it perfect. My only issue with the set was that it seemed like I could never get enough transfer solution on my nail to make the full rectangle appear saturated so that the print was dark enough to be visible. I tried to apply the solution over the square when I noticed this, but that was more hurtful than helpful. The harder I pushed with the cotton ball, the more the liquid spread over the paper, so perhaps this takes more practice. Believe me, I'm going to try this again to get it right because the idea is super smart. That being said, it actually faded with the gradient, so it looked somewhat intentional. 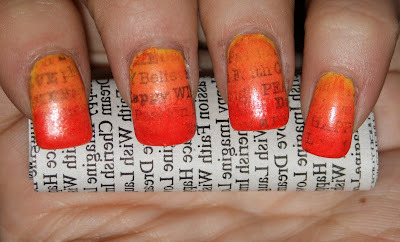 Just be sure not to move the print once it's on your nail, as you will wind up with smudged text like on my index finger. Overall, I think this set has a lot of potential. It just takes a little time to get the hang of. *SPECIAL ANNOUNCEMENT*: Be sure to come back to Princess Polish tomorrow, when I'll be giving away a special prize from The New Black. I'm not going to tell you what it is until then, BUT I will say that you should probably go ahead and like TNB's Facebook page to get an early start! All of The New Black sets are available at Sephora, Nordstrom, and Beauty.com. However, this collection is currently exclusive to Beauty.com. All of the sets, like Graffiti, Haze, Waves, and Runway include five 0.125 fl oz. bottles of polish. Polishes by TNB are 3-free, cruelty-free, and vegan friendly! The sets range from $10 to $32, with the Runway Collection retailing for $32. Remember to check back in because the fun continues tomorrow with a freebie! Disclaimer: The product(s) in this post were provided to me by the manufacturer or their PR company for consideration. For more information please visit my Disclaimer page. Product photos provided by The New Black. What a great idea for a set!! !